Over the next 20 years, the disease progressed. Asking for help was difficult. “Daily life is not easy for people living with a disability," says Kathleen. 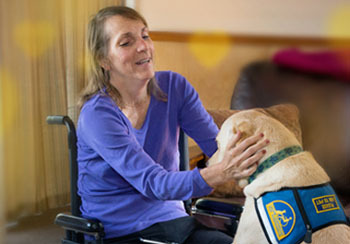 "Canine Companions has given my independence back to me through my service dog, Aruba." Donations from supporters like you helped us match Arbua with Kathleen free of charge. Make a Match. Give Independence and Give a Dog a Job. Free t-shirt with your purchase of $40 or more at Canine Companions’ online gift shop. Offer runs until February 28, 2017. Use promo code 1112 for the red t-shirt or code 1113 for the pink t-shirt at checkout. Limit one per order. Interested in lowering your income taxes from your IRA withdrawals while supporting Canine Companions? An IRA charitable rollover has been a popular choice among our donors. Learn more about the ways you can change lives through planned giving. Give Independence Monthly and Give a Dog a Job. 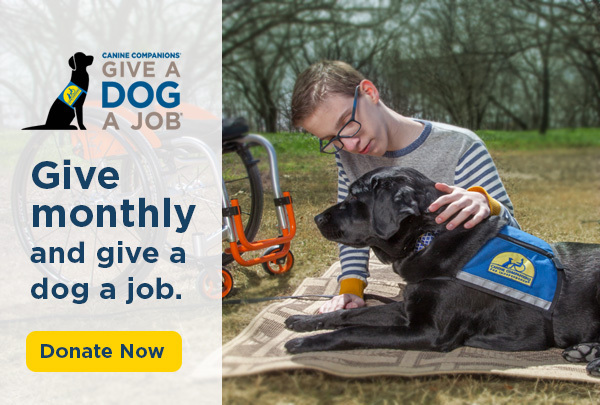 Become a Canine Companions Monthly Miracle Maker and for a limited time, with your monthly gift of $25 or more, you’ll receive a Give a Dog a Job double-wall tumbler as our thank you. Select an adorable eValentine when you make a gift in honor of someone you love. Graduation is this Friday! Join us in-person or online. Get behind the scenes of our professional training program. Follow us on Instagram.